If you are a book nerd, bookstore lover, book lover... whatever you want to call it... If you love books and everything that comes with them, read this book. Someone described this as a love letter to books, and I quite agree. I could probably call this review done at that, but I'll press on for those of you who need a little more. The Storied Life of A.J. 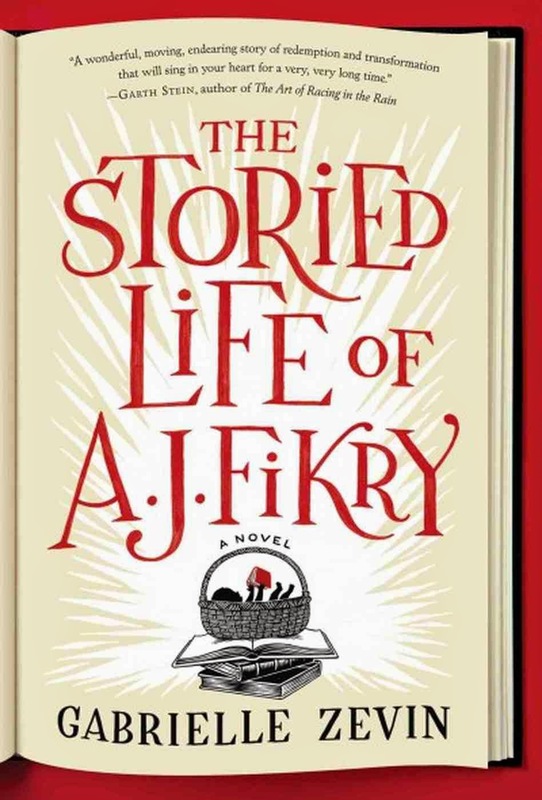 Fikry follows the life of A.J Fikry, owner of Island Bookstore on Alice Island. He's a 30-something man and book snob, who prefers to sell only literary novels in his shop. He's not really that likable of a guy. But you can't really blame him. The book starts off not too long after the death of his wife, and he buries his devastation over the loss in alcohol. Two thing happen near-simultaneously that set the story into motion. A.J. 's copy of Tamerlane by Edgar Allen Poe is stolen during one of his drunken evenings. (There are very few copies and one of them sold for some four hundred thousand dollars) because of this, A.J. unknowingly sets himself up to receive a mysterious package in his bookstore that will change the downward trajectory of A.J. 's life. He also meets Amelia, the Knightly Press sales rep. She's a single 30-something woman who's quirky, wears thrift shop clothes and galoshes (even when it isn't raining), has had a million bad dates, and she's still got a positive enough outlook on life that she doesn't let A.J. (who is terrible to her on their first meeting) get her down. First of all, this book is littered with passages that will make book nerds laugh, or at least feel a sense of kinship to other book nerds out there. Book and bookstore lovers will nod their heads over explanations of what books mean to us and why we love them, etc. A.J. Fikry claims, "Everything you need to know about a person you can know by asking 'What is your favorite book.'" And if they don't have a favorite book, at least what book has made a significant impact on their life. It's caused me to think about all the books that have made me, and I think I'll have to ponder it a little more so I can answer this question, if only to myself. Some things I loved about the way this book was written were that the passage of time, and many of the events happened quickly. You covered a lot of ground without sifting through too much detail. By the end of the book, readers have covered about 16 years. To Zevin's credit, this in no way diminished the story, plot or character building. I read this book fairly quickly (especially since it was a large print edition and not quite 300 pages), and it was nice to have a fun book to read that didn't require loads of concentration and could be read in a few short hours. Each chapter was marked by a short "book review"/book suggestion by A.J. and I enjoyed reading those a lot too. While it was a fun read, there was still a lot of sadness, and it felt authentic and relatable in more ways than book-lover ways. "There ain't nobody in the world like book people." "A place ain't a place without a bookstore." "We read to know we're not alone. We read because we are alone. We read and we are not alone. We are not alone." "We are not quite novels. We are not quite short stories. In the end, we are collected works. He has read enough to know there are no collections where each story is perfect. Some hits. Some misses. If you're lucky, a standout. And in the end, people only really remember the standouts anyway, and they don't remember those for very long." Edgar Allan Poe plays a prominent role in this book and the life of A.J. Fikry. I looked up Poe's favorite drinks and found that the man had a particular taste for brandy and that for years people suspected his drinking habits were what killed him. Anyway, some research also noted that Poe was a big fan of eggnog and that his family recipe has been handed down since 1790. (their recipe includes Brandy and Jamaican rum). I chose eggnog for this book as a tribute to Poe, and since you can drink it sans alcohol if you prefer.